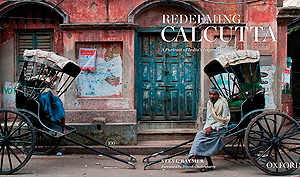 Raymer’s new book, Redeeming Calcutta, was published by Oxford University Press. IU School of Journalism professor and club member Steve Raymer showed photos and discussed the five years of newsgathering for his new book, Redeeming Calcutta, published in January. Raymer, a former National Geographic photographer who has worked all over the world, said his choice of subject matter was based on his longtime fascination with the city, one that many photojournalists have ignored. He said his book, which includes 13,000 words of text and 7,000 words of captions, looks beyond the significant poverty of the city to the paradoxes of modern culture and ancient tradition. The book, published by Oxford University Press, is the product of six trips to the city over a span of five years, with each trip designed to seek out more of Calcutta’s story. Raymer used his journalistic skills to network with guides, to gain access to places such as one of Mother Teresa’s hospitals, notoriously off-limits to journalists, and to show the city from unusual vantage points in order to juxtapose the new and the old. For example, one photo shows a shepherd leading his flock through the crowded streets — while talking on a cell phone. Others show children at play in the harshest of slums, majestic buildings in all their sunlit glory, abject poverty among street people and workers in a jute plant. Read a story on the School of Journalism website about Raymer’s work. Read IU School of Journalism Interim Dean Michael Evans’ review of the book. This entry was posted on Sunday, February 3rd, 2013 at 12:20 am and is filed under Guest speakers. You can follow any responses to this entry through the RSS 2.0 feed. Both comments and pings are currently closed. Membership is $25 per year, payable by mail or in person at the next meeting. All of our dues support our internship and scholarship program. We have no overhead costs.